Pope Francis announced yesterday, 30 September, that he will formally canonize two of his predecessors, John Paul II and John XXIII, on 27 April 2014. The date falls on the first Sunday after Easter and coincides with the Feast of the Divine Mercy, a feast added to the General Roman Calendar by then-Pope John Paul II in 2000. Based on the writings of Saint Faustina Kowalska, the message of the Divine Mercy is one of mercy and forgiveness. Pope John Paul II actively promoted devotion to the Divine Mercy and is closely associated with both Divine Mercy Sunday and Saint Faustina. Wawel Cathedral, Krakow, Poland. Blessed John Paul, then known as Karol Wojtyla, celebrated his first Mass as a priest in the Crypt of Wawel Cathedral on 2 November 1946. A side chapel devoted to Blessed John Paul contains a few drops of the future saint’s blood, displayed in a sleek, modern reliquary. Pope Francis’s choice of Divine Mercy Sunday is significant for a number of reasons. First, as noted above, Pope John Paul II is responsible for officially designating the first Sunday after Easter as Divine Mercy Sunday. Second, on the same day Pope John Paul II added Divine Mercy Sunday to the liturgical calendar—30 April 2000—he also canonized Saint Faustina. Pope John Paul II had previously beatified Saint Faustina on 18 April 1993. Finally, John Paul II was himself beatified on Divine Mercy Sunday, 1 May 2011, by then-Pope Benedict XVI. Sometimes referred to as John Paul the Great, Blessed John Paul is still wildly popular and widely revered in his native Poland. The Archdiocesan Museum (Muzeum Archidiecezjalne) in Krakow houses a number of artifacts associated with Blessed John Paul, including his skis, his watch, his personal breviary, and various liturgical vestments. The room where Blessed John Paul once lived has also been restored and contains a number of objects, including Blessed John Paul’s bed and his typewriter. The museum also possesses an assortment of sacred art and relics, primarily of Polish saints. Altar of Blessed Pope John Paul II, Church of Saint Florian, Krakow, Poland. The white skull cap encased in glass at the bottom of the photo once belonged to Blessed John Paul, who served as an Associate Pastor at the church from 1949 to 1951. Altar of Saint Leonard’s Crypt, Wawel Cathedral, Krakow, Poland. 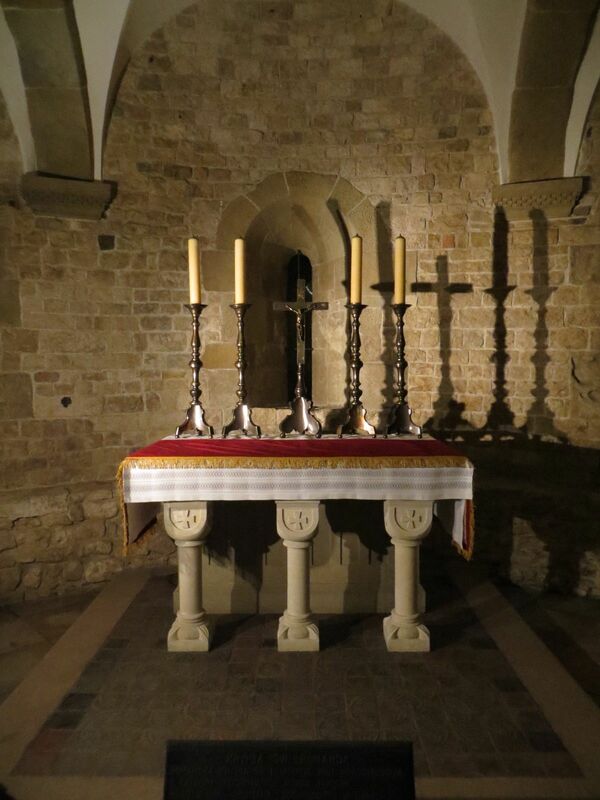 Blessed John Paul celebrated his first mass at this altar on 2 November 1946, a day after his ordination as a priest. Judas Iscariot, one of the original Twelve Apostles of Jesus, infamously betrayed Christ with a kiss in exchange for thirty pieces of silver. Following the Last Supper, Judas led the priests and Temple guards of the Sanhedrin to the Garden of Gethsemane, where he identified Jesus to the gathering crowd with a kiss. His treachery set in motion the events leading to the arrest, trial, and crucifixion of Jesus. Whatever the manner of his death, Judas’s betrayal opened a void in the ranks of the Apostles. At a gathering of Jesus’ followers, which met shortly after the Ascension, Peter proposed that the vacancy in the Apostolate be filled. Two disciples were nominated: Joseph, who was known as Barsabas, and Matthias. Not much is known of Matthias’s life following his election to the Apostolate. Some sources claim he preached first in Judea and then Ethiopia before he was eventually crucified for his faith. Others state he traveled to Ethiopia, where he preached near the sea of Hyssus, and died at Sebastopolis. Still others declare he was stoned and then beheaded in Jerusalem. Ultimately, Saint Matthias’s relics were purportedly brought to Rome by Saint Helena – although some speculate that the relics in Rome are those of a different Matthias: Saint Matthias, Bishop of Jerusalem, who died in 120. Some of Saint Matthias the Apostle’s relics were also translated to Trier, where they are currently kept in the crypt of the abbey church of Saint Matthias. Compared with the other Apostles, including Judas, Saint Matthias is infrequently portrayed in works of art. His iconography is also less well-defined. For example, while keys are a sign of Saint Peter and seashells are a common attribute of Saint James, no single symbol has come to distinguish Saint Matthias in the visual shorthand of Christian art. Veit Stoss’s magnificent Saint Mary’s Altar, located at the Basilica of Saint Mary in Krakow, Poland, includes one of the few depictions of Saint Matthias I’ve encountered. Carved in the late 15th century, Saint Mary’s Altar is the largest gothic altar in the world, measuring approximately 11 m (36 ft) long and 13 m (42.65 ft) high. The altar, or retable, is constructed as a pentaptych consisting of a large central cabinet and two pairs of wings: an inner pair that is hinged and can be used to close the cabinet, and an outer pair that is fixed. The altar is further supported by a predella and is surmounted by a finial of carved baldachins spread between thinly carved pillars. According to multiple sources, the doors of the altar are ordinarily kept closed during the liturgical year and are only opened for important feasts. On several recent visits to Krakow, however, I noted that the doors were generally opened for a few hours each day to allow visitor’s to view the central scene of Stoss’s masterpiece. The central scene of the open retable depicts two important events in the life of Mary – the Death of the Virgin (or Dormition) and the Assumption – while a variety of Biblical episodes are represented on the wings of the altar. The Dormition depicts a youthful Mary falling to her knees at the moment of her passing. Unlike more traditional depictions of Mary’s passing (such as the one pictured below), Stoss’s Dormition purposely omits references to death or dying to emphasize the extraordinary nature of Mary’s passage from earthly life. There is no deathbed in Stoss’s scene, although Mary continues to be surrounded by Apostles, including Saint Peter and Saint John. In my opinion, in addition to Mary herself, three figures in particular stand out in Stoss’s portrayal of the Dormition. The first is Saint James. Because of his central position and his dark, generous beard, the eye is naturally drawn to James, who stands above Mary, supporting her as she sinks to her knees. He is also one of the few figures that stares out towards to the viewer, seemingly making contact with the world outside the altar. The second is Saint John (pictured below), who stands to the right of Saint James, behind Mary. John is holding a blue cloak or cape, which he is raising in an enigmatic gesture. Some suggest he is lifting it to his face to dry a tear while others argue he is extending it to Mary. The third figure that stands out is purportedly Saint Matthias, whose unusual pose is noteworthy. Like the representation of Saint James, the figure of Saint Matthias is also centrally located in the scene, although he is arranged even closer to the center of the composition. His position serves as a visual link between Mary and the saints of the Dormition, and the Assumption, which takes place in the sky above his head. Matthias holds his hands outspread, his fingers interlaced, just above Mary’s head in a gesture some have described as one of protection. To me, however, Matthias’s interlaced fingers are reminiscent of a crown, and his gesture is suggestive of a coronation. Matthias almost appears ready to place a crown on the kneeling Mary’s head. Could the arrangement have been intended to evoke Mary’s imminent coronation as Queen of Heaven? It is interesting to speculate why Veit Stoss might have chosen to place Saint Matthias in so prominent a position on Saint Mary’s Altar. Alternatively, Saint Matthias may be the Apostle whose face, carved in profile, is just visible at the left of the composition. All twelve Apostles are present for Stoss’s Dormition, so Saint Matthias must be among them. In the absence of a clear pictorial tradition, however, identifying Matthias from among Stoss’s crowd of carved Apostles must remain a matter of conjecture. Nevertheless, as Rainer Kahsnitz notes in Carved Splendor: Late Gothic Altarpieces in Southern Germany, Austria, and South Tirol, “Presenting twelve apostles in a single scene—one or two of them young, the rest old and with flowing beards, was a notoriously difficult task for a Late Gothic artist. Only a very few carvers and painters proved themselves up to it.” Of those, Veit Stoss may have been the best. Matthew 27:3 (King James Bible). Acts 1:18 (King James Bible). See “St. Matthias,” New Catholic Encyclopedia, available at http://www.newadvent.org/cathen/10066a.htm (providing a general overview of sources describing the ministry of Saint Matthias). Id. (citing Nicephorus, 2 Church History 40, in 1 Nicene and Post-Nicene Fathers (Philip Schaff ed., Arthur Cushman McGiffert trans, 1890)). Id. (citing the The Synopsis of Dorotheus). Id. (citing Louis-Sébastien Le Nain de Tillemont, 1 Mémoire pour servir à l’histoire ecclésiastique des six premiers siècle 406-7). Id. (citing Jean Bolland, Acta Sanctorum, Maii, III (1680)). Krzysztof Czyzewski, Veit Stoss: Mary’s Altar 10 (Aleksander Ptak et. al, trans. 2007). See, e.g., Czyzewski, supra note 12, at 11; Teresa Czerniewicz-Umer, Eyewitness Travel: Cracow 96 (2010). The following scenes are depicted on the internal wings of the altar and are visible when the doors are open: the Annunciation, the Nativity, the Adoration of the Magi, the Resurrection, the Ascension, and Pentecost. The following scenes are visible when the doors of the altar are closed: the Meeting of Saint Anne and Saint Joachim, the Birth of the Virgin, the Presentation of the Virgin in the Temple, the Presentation of Christ in the Temple, Christ Among the Doctors, the Capture of Christ, the Crucifixion, the Lamentation, the Entombment, Christ Appearing to Mary Magdalene (Noli me tangere), the Three Marys at the Sepulcher, and the Descent into Hell. Czyzewski, supra note 12, at 12. In her travel guide to Krakow, Teresa Czerniewicz-Umer opines that the “figure of the youthful Mary is one of the greatest sculptures ever made in Poland.” Czerniewicz-Umer, supra note 15, at 97. Czyzewski, supra note 12, at 12. In Carved Splendor: Late Gothic Altarpieces in Southern Germany, Austria, and South Tirol, Rainer Kahsnitz states, “In accordance with legendary tradition going back more than five hundred years—the Gospels say nothing about the death of the Virgin—the standard Dormition shows the apostles, miraculously transported from their far-flung missions, convened around Mary’s deathbed . . . .” Rainer Kahsnitz, Carved Splendor: Late Gothic Altarpieces in Southern Germany, Austria, and South Tirol 137 (2006). Rainer notes that portrayals of Mary kneeling in prayer before her death was a form that “spread from Bohemia to southeast Germany, Austria, and adjacent territories in the late fourteenth century.” Rainer, supra note 19, at 137. Rainer identifies this figure as possibly being Saint Paul rather than Saint James. Id. at 139. Rainer identifies this figure as possibly being Saint Philip rather than Saint John. Id. at 140. See, e.g., Czyzewski, supra note 12, at 29 (featuring a caption reading “St. John raises the rim of his coat to dry a tear,” which accompanies a detail of The Dormition); Czerniewicz-Umer, supra note 15, at 97 (featuring a caption beneath a detail of Saint John stating “the saint is about to put a cape on the fainting Mary”). Rainer identifies this figure as possibly being Saint John rather than Saint Matthias. Rainer, supra note 19, at 139. In the Assumption, Christ and Mary are being raised to heaven by angels. Czyzewski, supra note 12, at 12 (noting that one of the Apostles “protects” Mary with his “hands above Her”). Rainer, supra note 19, at 140. Images of a knight serenely dousing a burning building with a bucket of water have mystified generations of travelers journeying through Europe. The knight can be found atop pillars in city squares, emblazoned on buildings, and perched beside church altars. Depictions of the knight, identifiable as Saint Florian, are particularly common in central Europe, where he continues to be honored and venerated to this day. I have even encountered his statue in a Salzburg hotel calmly quenching a fire with a telltale bucket and have wondered at his likeness on a fire extinguisher in the sleepy town of Maria Alm, Austria. Why does Saint Florian carry a bucket? What is the meaning of the burning building at his feet? And why is he so popular in central Europe? According to various sources, Florian was beaten with clubs, was “twice scourged, half-flayed alive and finally thrown into the river Enns with a stone around his neck.” Because he was martyred by drowning, Saint Florian is often invoked as a protector against drowning or against danger from water, including flooding. He is also frequently portrayed in art with a millstone around his neck or in close proximity. Saint Florian is also recognized as the patron saint of firefighters, although the reason for his association with firefighting is unclear. Some commentators have tried to link the origin of the tradition to his martyrdom, although Saint Florian was not recognized as a protector against fire until much later. Florian’s association with firefighting likely derives from a legend that arose in the Middle Ages, a legend that also explains why he is commonly portrayed with a bucket and a burning building. Modern commentators appear to be reaching for a link between Saint Florian’s martyrdom and his status as a protector against fire. However, because Saint Florian did not become identified with firefighting until centuries after his death, during the late Middle Ages, it is unlikely the circumstances of his death precipitated the tie to firefighting. Most representations of Saint Florian depict him dressed as a Roman soldier or a medieval knight holding either a banner or sword in one hand, a bucket or pitcher in the other, with a burning building, city, or church at his feet. Alternatively, as mentioned above, he may be shown with a millstone, the instrument of his death. According to a catalogue published by the Metropolitan Museum of Art, Saint Florian first appeared with a bucket and a burning building in the late 15th century. According to legend, Saint Florian managed to save a burning house – sometimes it is as an entire city – with a single bucket of water. Florian’s reputation as a protector against fire earned him great devotion in medieval society, which lived in constant fear of fire and the threat of urban conflagration. Representations of Florian as a firefighting saint quickly gained popularity, particularly in Austria and southern Germany. In the region even today, Saint Florian has become so synonymous with firefighting that his image is readily used to identify fire stations and departments. The exteriors of firehouses frequently feature an image of Saint Florian on a wall or a statue of Saint Florian tucked into a niche. The name “Florian” even serves as a universal radio call sign for Feuerwehr (fire department) vehicles and stations. Beyond Austria and Germany, Saint Florian’s influence on firefighting may be less conspicuous, but it is still discernible. Many fire departments incorporate what has come to become known as a “Florian cross” or “cross of Saint Florian” into their badges, patches, and other organizational emblems. The cross features four triangular arms, of equal length, that are rounded at each terminus and that taper toward the center. (An example is depicted at left, courtesy of Wikimedia Commons.) Often confused with the Maltese cross, which has no curved lines, the origin of the Florian cross’s design remains obscure. Many commentators have argued that the Maltese cross, which the Knights of Saint John famously wore to identify members of their order, became a symbol of firefighters because firefighters, like the earlier knights, were willing to lay down their lives to protect others. While this explanation may sound plausible, it ignores the fact the Florian cross is simply not a Maltese cross. Alternatively, the Florian cross may have evolved from a Maltese cross over time. (An example of a Maltese cross is depicted at left, courtesy of Wikimedia Commons.) Many cross variations share similar features, and it is possible the Maltese cross gradually developed into a Florian cross over the course of several centuries. A comparison of the two symbols – one featuring relatively thin, angular arms, the other comprised of broad, curved arms – suggests, however, that such a radical metamorphosis is unlikely to have occurred. Another explanation is that the Florian cross is sui generis – though possibly inspired by the Maltese cross. The various representations of Saint Florian I’ve examined, mostly from the medieval period, offer no clues to the cross’s origin. Occasionally, Saint Florian is portrayed holding a banner emblazoned with a cross, but the cross it features is invariably a simple Latin cross. In at least early representations of Saint Florian, the saint does not appear to wear or carry the symbol that has come to bear his name. On the other hand, many protective medals and medallions featuring Saint Florian are shaped in variations of the Florian cross, with broad, curved arms enclosing an image of the saint. Could the shape of early Saint Florian medallions have inspired the outline of the Florian cross? Perhaps it’s a question of the chicken or the egg, and ultimately, I do not know how the Florian cross came to be. My guess is the design derives from the late 19th century, since that appears to be when fire departments began to incorporate a cross into their emblems. In addition to serving as the patron saint of firefighters, Saint Florian is also the patron saint of various localities, including Linz, Austria; the state of Oberösterreich (Upper Austria), Austria; and Poland. According to legend, after Florian was drowned in the Enns, his body was recovered by a devout woman named Valeria and was buried. His body was eventually transferred to the Augustinian Abbey of Saint Florian, near Linz. In 1184, Pope Lucius III sent relics of Saint Florian to Duke Kasimir the Just of Poland. Kasimir had the relics sent to Krakow, one of Poland’s oldest and most important cities. According to tradition, the horses carrying the relics stopped in Kleparz, a medieval suburb of the Cracow, before reaching the city gate and refused to continue any further. Their obstinacy was interpreted as a sign, and the church of Saint Florian (pictured above) was erected on the spot to house the relics. After the capital was moved from Krakow to Warsaw, the church of Saint Florian became the receiving point for the bodies of deceased royalty, who continued to be buried at Krakow’s Wawel Cathedral. Royal funeral processions followed what became known as the Royal Road or Royal Route, a course replete with references to Saint Florian. The route originated at the church of Saint Florian, passed through the 14th century Florian Gate with its polychrome figure of Florian extinguishing a gilded fire, and continued along Floriańska Street before reaching the Main Market Square. From there, the route wound through the Old Town, past the Church of Saints Peter and Paul, to Wawel Hill and its looming cathedral. May I Propose a Toast . . . While Saint Florian may also serve as a patron saint of brewers, it is as the patron saint of firefighters that he is frequently identified today. In fact, in 1999, the date of International Firefighters Day was fixed as May 4th, the feast day of Saint Florian. Fittingly, both Saint Florian and the heroic firefighters he is often invoked to protect, may now be celebrated and remembered on the very same day. See, e.g., 2 Butler’s Lives of the Saints 230-31 (Herbert J. Thurston, S.J. & Donald Attwater eds., 2d ed. 1956). Monumenta Germaniae Historica: Passiones Vitaeque Sanctorum Aevi Merovingici et Antiquiorum Aliquot 65-71 (Bruno Krusch ed., 1896), available in translation at http://www.ucc.ie/milmart/BHL3054.html. Butler’s Lives of the Saints, supra note 2, at 230. See, “Saint Florian: The Patron Saint of the Fire Service,” The Public Safety Net, available at http://www.publicsafety.net/st_florian.htm; see also, “Saint Florian,” Saint Florian Roman Catholic Church, available at http://www.stflorianparish.org/en/history/saint-florian/; “Saint Florian History,” Brookline Firefighters Association, available at http://www.brooklinefirefighters.org/index.cfm?zone=/unionactive/view_page.cfm&page=St20Florian. See, e.g., The Public Safety Net, supra note 8; Saint Florian Roman Catholic Church, supra note 8; Brookline Firefighters Association, supra note 8. See 1 Mai 463-466, in Acta Sanctorum Quotquot Toto Orbe Coluntur (1863), available in translation at http://www.ucc.ie/milmart/BHL3058.html. See Metropolitan Museum of Art, Medieval Art from Private Collections: A Special Exhibition at the Cloisters 61 (1968) (“At the end of the Middle Ages he came to be regarded as a protector against fire.”). Id. (“The earliest representations of him with a bucket and a burning house are of the late fifteenth century.”). See, e.g., George Ferguson, Signs and Symbols in Christian Art 71 (1959). See Donald V. Engebretson, “The Firefighter’s Cross,” Northwoods Seelsorder Blog, Mar. 8, 2008, available at http://nwseelsorger.blogspot.de/2008/03/firefighters-cross.html. See, e.g., “History of the Maltese Cross,” New York City Fire Dept., available at http://www.nyc.gov/html/fdny/html/history/maltese_cross.shtml (arguing that the Knights of Saint John were “our first firefighters” because they regularly put out fires ignited by weapons during the Crusades). Some fire departments, however, do incorporate a Maltese cross, rather than a Florian cross, into their emblems. See, for example, the Canadian Fire Service. See, e.g., Mica Calfee, “The ‘Maltese Cross’ and the Fire Service,” available at http://www.fireserviceinfo.com/maltesecross.html (citing a 1882 newspaper article describing a local NY fire department’s decision to adopt a new “Maltese cross” badge design); “Origins of the Fire Service Badge,” Hampshire (UK) Fire and Rescue Service, available at http://www.hantsfire.gov.uk/theservice/organisation/history/servicebadgesorigin.htm (“Quite when the star was first used in this country for the badge of a firefighter is not easy to establish. The earliest example found is the brass eight pointed star adopted for use by the National Fire Brigades Association in 1887.”) The 1887 National Fire Brigade Association badge appears to be an actual Maltese cross. Over time, it evolved into something quite different, although the original eight points of the Maltese cross are still discernible. Could the Florian cross have developed similarly over time? The Correspondence of John Lothrop Motley, supra note 1.